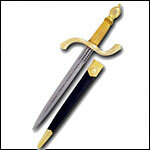 The Knights Thrusting Medieval Dagger is historically designed and authentically crafted. A choice knife for "thrusting" through the rings of chainmail armor. Our Toledo Lion Dagger on Plaque features a Lion Dagger with a Red Handle. Length is 17.7", weight is 2.42 pounds. Our Toledo Bird Dagger features bird's heads in opposite directions as the hilt. Length is 17.7", weight is .77 pounds. Our Toledo Bird Dagger features bird's heads in opposite directions as the hilt, constructed at the old forge. Length is 17.7", weight is .77 pounds. Our Toledo Eagle Dagger features eagle wings spread in opposite directions as the hilt. Length is 17.7", weight is .77 pounds. Our Toledo Eagle Dagger features eagle wings spread in opposite directions as the hilt and was constructed at the old forge. Length is 17.7", weight is .77 pounds. Titleburg Pugio Dagger crafted from high carbon steel. Grip is a composite of horn and steel secured with multiple steel rivets. The scabbard is of wood bound in leather and completed with brass fittings and brass hanging rings. Our Venetian Stiletto is copied from a beautiful stiletto that caught our eye on a recent trip to Venice, we were touring the Doge's Palace and admiring the weapons. Stilettos came in many sizes, from delicate little hideout weapons to forthright long daggers suitable for use even as a main gauche. Our Viking Dagger has a grooved wooden grip with a solid brass pommel and engraved guard. This Viking period Dagger comes with an EN45 carbon steel double fullered blade. The Viking Sax was an all purpose belt knife or dagger. Used for fighting the Sax was also handy as a camp tool. Our Toledo Lion Dagger, features a gold finish. Length is 17.7", weight is .77 pounds. Our Toledo Lion Dagger, features a silver finish. Length is 17.7", weight is .77 pounds. Our Toledo Roman Lion Dagger features a Roman Blade and a gold finish. Length is 22.8", weight is 2.20 pounds. Our Toledo Roman Lion Dagger features a Roman Blade and a silver finish. Length is 22.8", weight is 2.20 pounds. Our Toledo Lion Dagger, forged at the Old Toledo Forge. Length is 17.7", weight is .77 pounds. Our Viking Dagger is made from high carbon spring steel, wire wrapped grip and includes a leather sheath. Our Viking Dagger has a blade forged from high carbon steel with a hilt of brass. The grip is wood wrapped in leather with twisted brass wire inlay. The sheath is stitched leather and is finished with an integrated belt loop. The Viking Sax 2 was an all purpose belt knife or dagger. Used for fighting the Sax was also handy as a camp tool. The Viking Sax was an all purpose belt knife or dagger. This version has a bone grip. Used for fighting the Sax was also handy as a camp tool. The Viking Sax was an all purpose belt knife or dagger. This version has a horn grip. Used for fighting the Sax was also handy as a camp tool.